This week’s verse is one of my favorites. I have often recited it to myself or others when fear rose up, and indeed it was a reminder that fear is not of God, so we should not allow it to come upon us. God has given us power, love, and a sound mind ( which is self-control or discipline). We receive those from His Holy Spirit that lives within us. The spirit of fear will try to come upon us in certain situations we may face, but we should not entertain it. 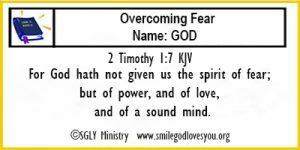 We should use the self-control He has given us to cast fear out of our minds and we should face it and overcome it with the power God has given us. So, this week let’s memorize this verse so that we have it stored in our minds and hearts to use whenever fear rises up. Blessings to you this week as you walk in His Spirit filled with power, love and a sound mind.